Chairman Dave Camp (R-MI) of the Ways and Means Committee detailed some significant changes specific to the tax treatment of S corporations in the tax reform plan he recently released. The biggest changes would reform payroll tax treatment for owners of S corporations, the treatment of active and passive income, and the differentiation between manufacturing and non-manufacturing income (e.g. service or retail businesses). The focus of Rep. Camp’s plan was to create a simpler tax code with lower rates in exchange for a broader tax base. 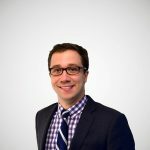 Pass-through businesses – sole proprietorships, partnerships, and s corporations – pay taxes on individual income tax forms, so the changes to the individual code impact these types of businesses. Camp’s plan would consolidate 7 brackets down to effectively 3 brackets of 10, 25, and 35 percent (which includes a 10 percent surtax for non-manufacturing high earners and is calculated under a new definition of income). He would repeal the alternative minimum tax and increase the standard deduction while modifying or eliminating many current tax provisions. Specifically for small businesses, the plan would set the level for section 179 business expensing at $250,000 (down from $500,000 in 2013). These are positive changes, but overall the tax reform plan does little improve the tax code for small businesses, specifically S corporations. The proposal leaves in place high tax rates for many S corporations, subjects them to additional payroll taxes, creates new distortions between types of industries, and produces two tax rate bubbles. Included below are the major changes to the taxation of S corporations under Camp’s plan, including a state by state comparison of top marginal tax rates under Camp’s plan versus current law. You can find all the basics of his plan here. Camp’s tax reform package introduces complication with a new 10 percent surtax for non-manufacturing income. To make things more complicated, the additional 10 percent surtax would be calculated on a different income scale: modified adjusted gross income or MAGI. This essentially creates two side by side tax codes, a la the AMT, and individuals and businesses would have to calculate their AGI for one and their MAGI for the other. MAGI aside, this tax provision would favor manufacturing over non-manufacturing industries, such as retail or service industries. This non-neutral tax treatment distorts the economy and should be avoided when designing a new tax system. 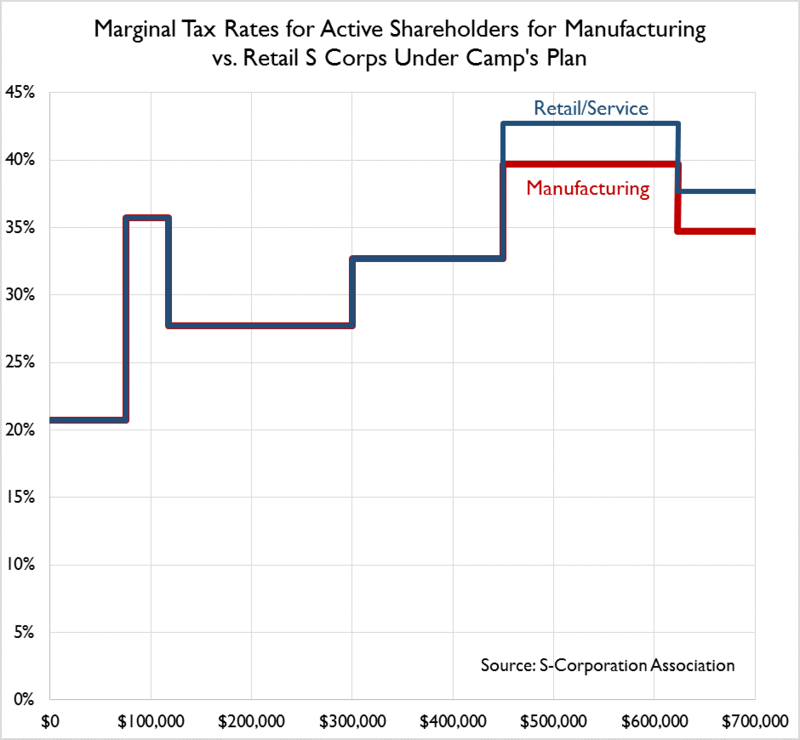 In the chart below, you can see the difference in marginal tax rates for an S corporation in a manufacturing industry compared to an S corporation in a retail or service related industry. All industries face the same marginal tax rate until the 10 percent surtax begins at $450,000 MAGI for a joint filer ($400,000 for single). The surtax means S corporations in a non-manufacturing industries with income $450,000 and above would face higher marginal tax rates than manufacturing businesses. While it appears that manufacturing businesses avoid this rate all together, due to new 70/30 split self-employment rule (which we discuss more below) active shareholders will still be hit by 70 percent of surtax, or a 7 percent surtax. For active shareholders, manufacturing businesses face a top rate of 34.7 percent and non-manufacturing faces a rate of 37.7 percent. For passive shareholders, the difference between business types is the full 10 percentage points of the surtax. This surtax impacts a large amount of business income due to the fact that nearly 70 percent of employer business income is earned by business owners with income over $500,000. 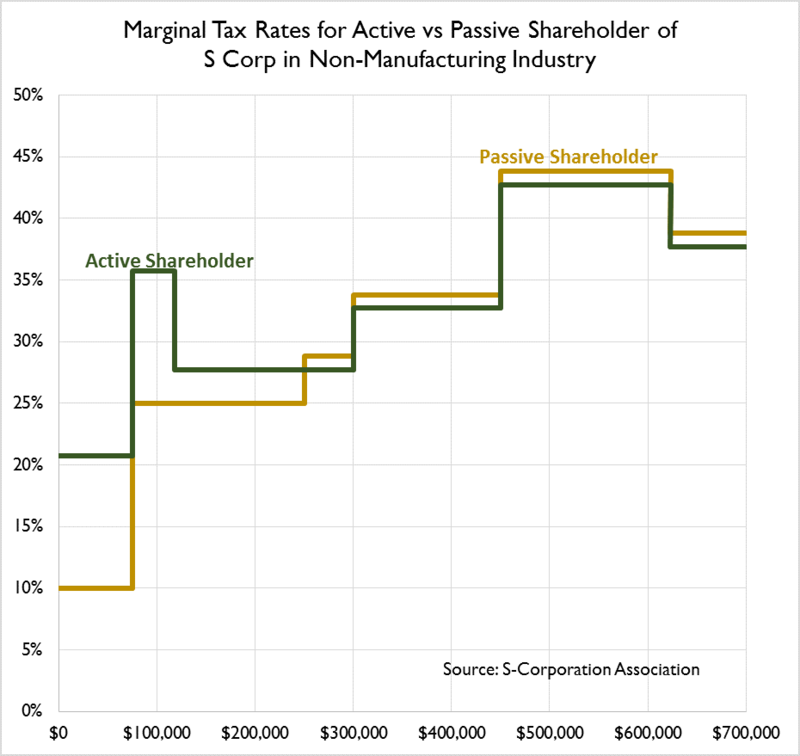 The difference between active and passive shareholders is important for determining the marginal tax rates for S corporations under Chairman Camp’s plan. Active shareholders are those actively involved in the running of a business. They act as both an owner of the business and an employee. This means they receive wages and a share of distributed profits. Currently, active shareholders must take a reasonable salary as defined by the IRS. This is to prevent owners of S corporations from avoiding the payroll tax. Passive shareholders serve solely as stockholders or owners of the S corporation. They do not take an active role in the day to day operations of the company and do not receive wages. Like active shareholders, passive shareholders pay taxes on their individual income tax return at individual tax rates. Additionally, passive shareholders with incomes over $250,000 are subject to the 3.8 percent surtax in the Affordable Care Act. Under current law, the IRS requires business owners to pay themselves a reasonable wage in order to prevent people from gaming this income distinction in order to avoid the extra 15.3 percent payroll tax hit. Camp’s plan would replace the current reasonable wage standard with a 70/30 split, changing the rules for active shareholders. The rule would require that active shareholders of S corporations report 70 percent of their total earning as wage income. Every dollar a business owner receives in S corporation income will be summed together. This income will be then split into two parts. 70 percent of the income will be considered wage income and be taxed with the additional payroll tax. The remaining 30 percent will be considered business income and be exempt from the payroll tax. For S-Corporations that make a significant amount of money, and paying a reasonable wage as in the above example, this rule will mean a tax increase. In contrast, if the S-Corporation is currently paying all of its profits are wages, this will actually mean a tax cut. In total, this change would act as a tax increase of $15.3 billion over ten years for S corporations. Another element of Camp’s tax plan is the creation marginal tax rate bubbles. This occurs when a marginal tax rate, for example, goes from 10 percent to 15 percent and back down to 10 percent. We have a post that discusses the marginal tax rates under Camp’s plan, which you can find here. Specifically for S corporations, Camp’s plan would create two bubbles for active shareholders and one bubble for passive shareholders for both manufacturing and non-manufacturing businesses. The chart below shows these bubbles using the rates for non-manufacturing businesses. The reason for the first bubble is the new 70/30 split rule for payroll, or SECA, taxes. Active shareholders of S corporations would be required to pay a payroll tax of 15.3 percent on 70 percent of their income below the FICA cap of $117,900, or put differently, a 10.7 percent tax on all income up to the cap. Above the FICA cap, active shareholders are required to the Medicare tax of 3.8 percent on 70 percent of income, or 2.7 percent tax on all income above the cap. The second bubble, which both passive and active shareholders face, is due to the phase out of the 10 percent tax bracket and the phase out of the standard deduction. These phase outs begin at $300,000 for joint filers ($250,000 for individuals) of MAGI. Reduction of the top marginal tax rate from 39.6 percent to 25 percent plus a 10 percent surtax applied to non-manufacturing income. The introduction of the 70/30 split rule, subjecting S Corporation profits to self-employment taxes. The table below compares the combined state and federal top marginal tax rate of S corporations under current law to Camp’s plan by state. In general, S corporations will see slightly lower top marginal tax rates. The exception, of course, are S corporations with manufacturing income. They will face lower top marginal tax rates as a result of being partially exempt from the 10 percent surtax. Non-manufacturing S corporations in ten states with relatively high state and local income taxes are the only ones that will face slightly higher marginal rates. This is mainly due to the repeal of the state and local income tax deduction. Update: The marginal tax rates for active shareholders in the manufacturing sector were updated to reflect the correct treatment under the 70/30 split rule.